What’s a rhino without its horn? Well, dozens of threatened rhinoceroses living in the iSimangaliso Wetland Park, located along South Africa’s lush east coast had to face that question last month when park authorities removed all their horns to keep them safe from poachers. The question itself may seem existential but is incredibly relevant. A rhino’s horn is so integral to its survival in the wild, place in the herd hierarchy and even its social behaviour that removing the horn could affect its long-term wellbeing. For conservationists though, this is really their last ditch attempt to deter poaching which has spiralled out of control. The entire procedure takes a cheap and cheerful 20 minutes to execute. 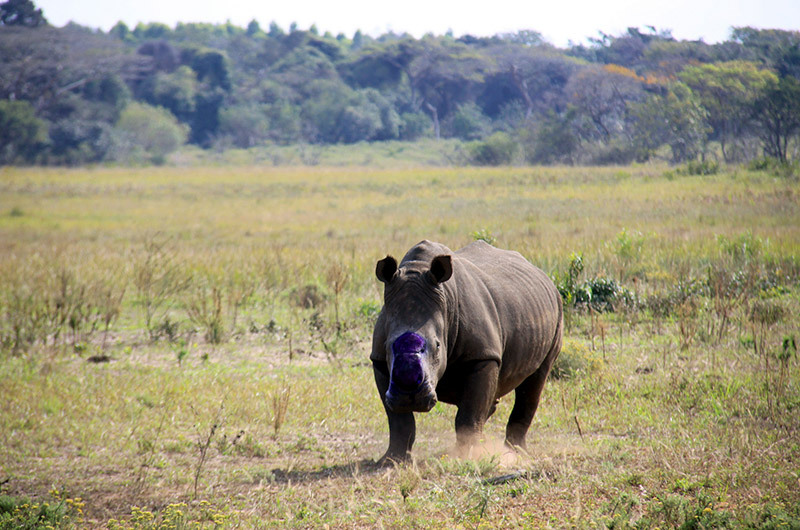 The iSimangaliso Park itself has already lost more than 250 rhino in the last two years to vicious and violent poaching incursions. The belief is that by removing the tempting horns, poachers will lack incentive and leave the rhinos in peace. 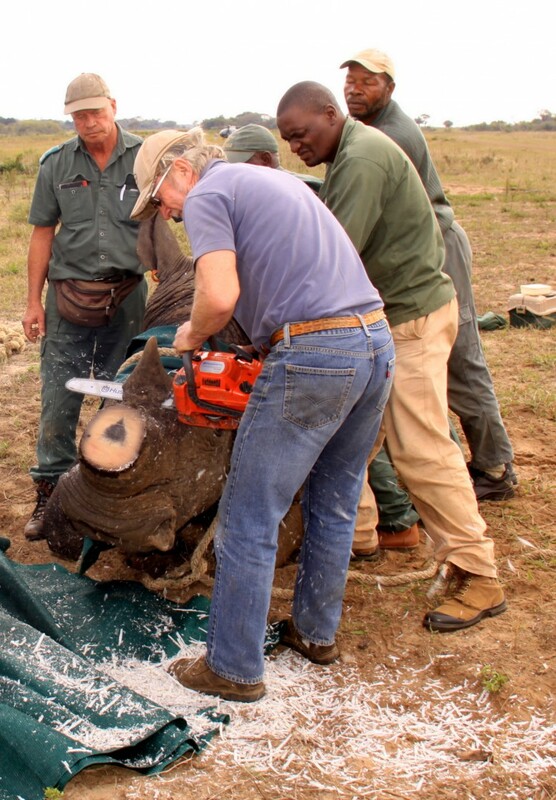 The procedure itself is fairly simple: the rhino is sedated and minimally restrained while a wildlife veterinarian saws off the horn, a bit like you would cut off a fingernail… the entire procedure takes a cheap and cheerful 20 minutes to execute. Dehorning to deter poachers is a popular but controversial practise favoured by conservationists who are becoming more and more desperate to save the species by any means necessary. Wildlife trafficking and poaching in particular, has steadily escalated into an extremely critical global conservation problem – from just a handful of poaching incidents just eight years ago, today rhinos are poached at a rate of one every eight hours; that’s more than a thousand every year and well beyond the manageable number to keep the species alive. The rise in demand for rhino horn has been nothing short of meteoric: more valuable per the gram than both gold and cocaine, rhino horn forms part of the massive illegal global trade in wildlife products, which comes third only to human trafficking and guns as the world’s largest black market. Fuelled by a ferocious thirst from the Asian market, especially China and Vietnam, demand for horn has spiked sharply in recent years and now as that demand starts to outpace supply the entire rhino species is facing the very stark and serious threat of extinction. It’s not an idle warning either… already several sub-species of rhino have gone extinct as a direct result from poaching: back in 2011 the Javan rhino was declared extinct in Vietnam as was the western black rhino in Africa. Earlier this year the Sumatran rhino, widely believed to be the oldest living rhino species in the world and the closest living relative to the woolly mammoth, was listed as extinct in the wild in Malaysia; and the northern white rhino in Africa has been reduced to just four animals in the wild (‘extinct in the wild’ means the animals have been wiped out in their natural habitat and now only exist in captive breeding programs and zoos). Removing the horn could actually anger poachers who may still kill the rhinos out of spite… which has happened a lot in the past. All this has triggered a barrage of strategies aimed at keeping the species afloat. From poisoning and electronically tagging rhino horns, to secreting large herds of rhino out of heavily poached areas into covert reserves across the continent, using drones to monitor rhinos in the wild – authorities are throwing everything they have at the problem. Unfortunately, few of these seem to stick because poachers are becoming more bold and innovative too in their approach, using paramilitary gear and helicopters to track and kill isolated rhino herds. So now conservationists are revisiting the idea of mass dehornings, a method employed several times in the past 20 years of rhino conservation throughout Southern Africa, though one with intermittent success and quite a few drawbacks. Aside from the fact that rhinos do actually need their horns to be, well, rhinos, removing the horn could actually anger poachers who may still kill the rhinos out of spite… which has happened a lot in the past. 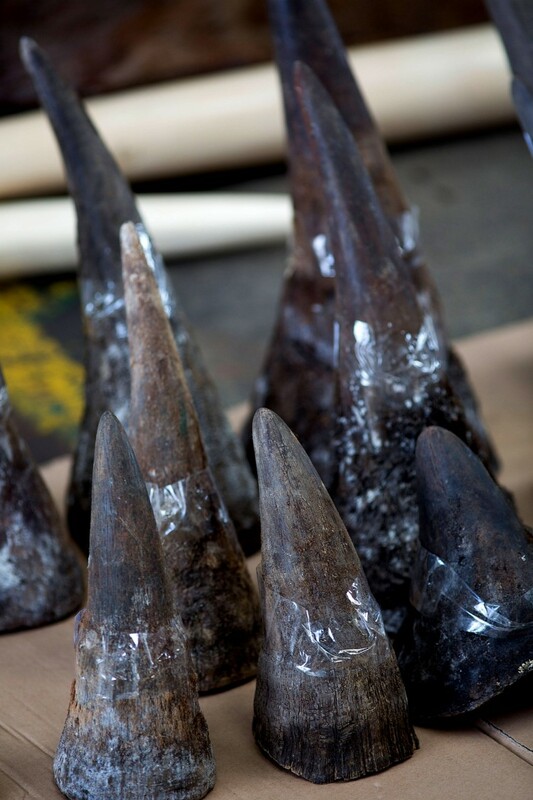 Rhino horn is also organic and keratin-based like fingernails, so it grows back – cutting off the horn now is just a band aid solution and will have to be repeated over and over again as long as the problem persists, which is likely to be for quite some time. Then there’s the question of how much horn do you cut out? While it may be painless solution to cut off just the protruding bulk of exposed horn the rest is actually embedded in the rhino’s face and cannot be removed… for many poachers the promise of a payday would be good enough motivation to kill the rhino even for the small stump of horn still present. They go into a state-controlled stockpile and are either destroyed or auctioned off at a later point. Neither option is really all that heartening. It’s tempting now to dismiss the idea of dehorning as ineffective and unnecessary, except that there really are no easy solutions here and, in reality, dehorning is going to happen anyway because of its moderate success when used in conjunction with a broad swathe of conservation methods (basically, we are doing everything we can think of at the same time and hoping all the strategies work better together where individual methods fail themselves). But if we were to digress into another overarching concern for a minute when it comes to dehorning: what happens to all of those incredibly valuable horns now free of their cumbersome rhinos? There are several different answers to this – depending on which official body you ask – mostly, they go into a state-controlled stockpile and are either destroyed or auctioned off at a later point. Neither option is really all that heartening. If the horns sit in a stockpile for any sustained period of time it leaves room for potential theft and illicit siphoning off the top – even if the horns are treated so that they cannot be sold (which officials claim is what does happen to stockpiled horns) there is not enough monitoring in place to make sure that this is done. At this point it may be worth noting that you’ll need several official clearances and permits to remove and transport a horn anywhere in place even for the legitimate team from iSimangaliso; the government doesn’t make it easy for you to cheat the system. The problem is not the legislation; it’s enforcing the legislation. There aren’t enough boots on the ground to back up government mandates tackling poaching. Then sometimes officials can find themselves on the wrong side of the law for doling out illegal permits in exchange for cash bribes, as we’ve seen in the case of convicted Thai poaching kingpin Chumlong Lemtongthai. In reality, for these protocol to work as intended the entire system needs to be tightened up and that isn’t easy to do without a lot more funding and resources. Which is where the other option for stockpiled horns comes in: auctioning the horns, which happens once every few years as designated by international wildlife trade body CITES. The idea is that the money raised can go back into conservation which will potentially solve many capacity and funding shortfalls at a local level. But many conservationists argue that auctions actually drive demand for rhino horn (and ivory) and buoy the market instead of shutting it down. 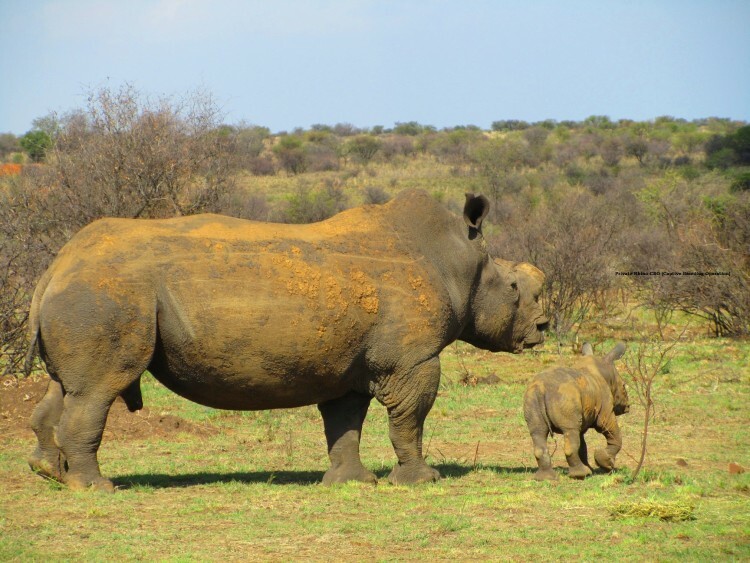 Arguably the only people who really benefit from this are those in the business of commodifying rhinos and rhino horn – which is why many lobby groups are also against proposals to lift the ban on the trade on rhino horn and legalise it. It’s a system the enforces the skewed ideal that a rhino (and wildlife in general) is worth more dead or maimed, than alive… and no matter which way you swing the conservation argument on that one, it’s never a good place to be when you’re trying to save a species.